Being from the South, one of my favorite meals is BBQ pulled pork! I especially love BBQ pulled pork on a nice hot sesame bun and a slather of cole slaw. Oh yum! I wanted to re-create this dish using some healthier alternatives. I definitely had to ditch the bun. No bun hun! 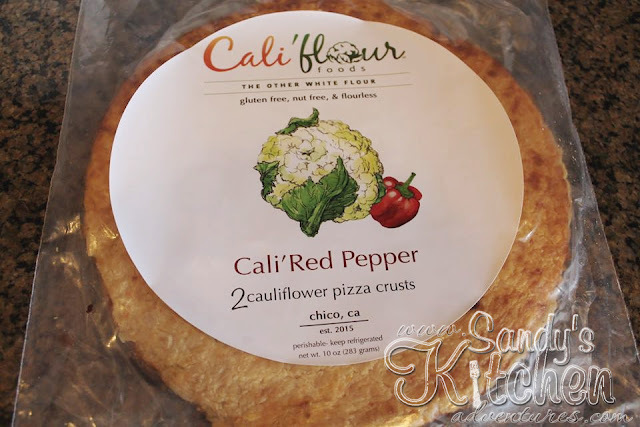 I decided to use the already prepared cauliflower pizza crust from Cal'flour Foods. Why do I love them so much? I love not having to spend an entire afternoon making my own crusts. They comes shipped to my door in a matter of days by priority mail! Talk about convenience! No soggy veggie crusts and they bake up nicely! 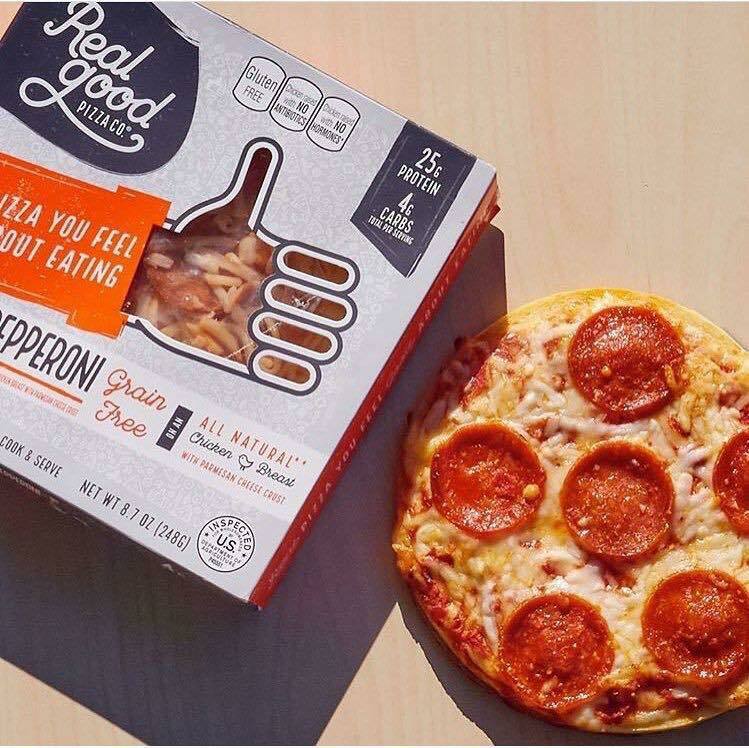 There is also a Plant Based Italian crust made with no eggs or dairy. I can't say enough good things about this product! I just love, love, love them! The next thing I did was choose leaner chicken breasts over pork. 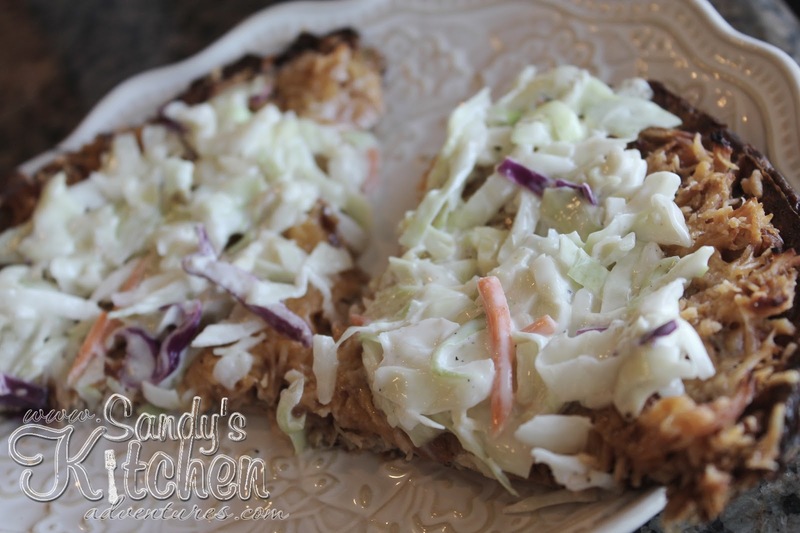 This allowed me to use up a healthy fat, which is the mayo, to make the cole slaw that tops the pizza. To make the pulled BBQ chicken, I decided to use my new Instant Pot! 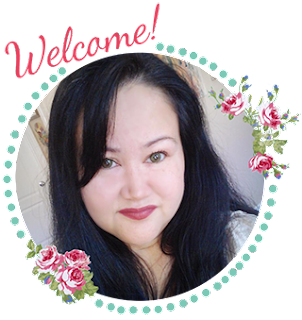 I am still fairly new to the whole pressure cooker scene, but so far I am loving it! 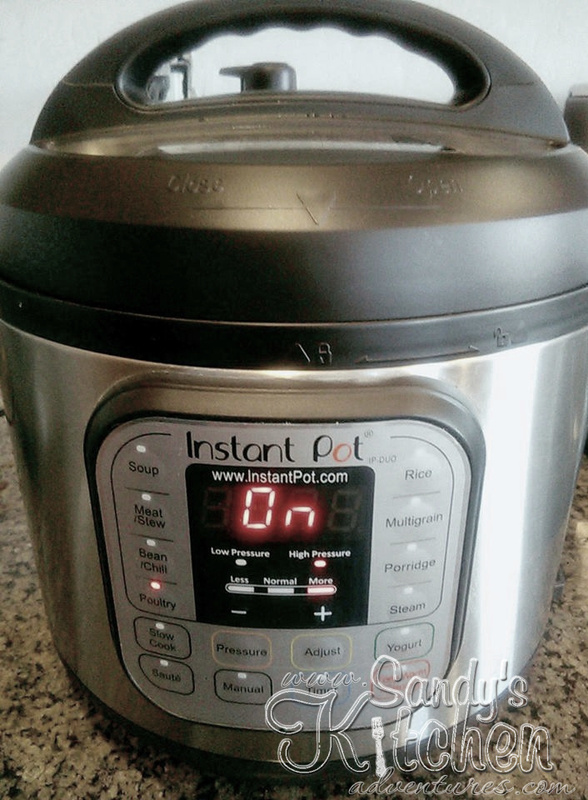 If you don't have an Instant Pot, don't worry! Use your trusty old slow cooker! I still love my slow cooker! The Instant Pot does cook up faster than a slow cooker, but don't think the 25 minute cooking time is all there is to it. It takes about 10 minutes for the Instant Pot to come to pressure. Then 25 minutes to cook and then tack on the 10 to 15 minutes (maybe more) to do a natural pressure release. 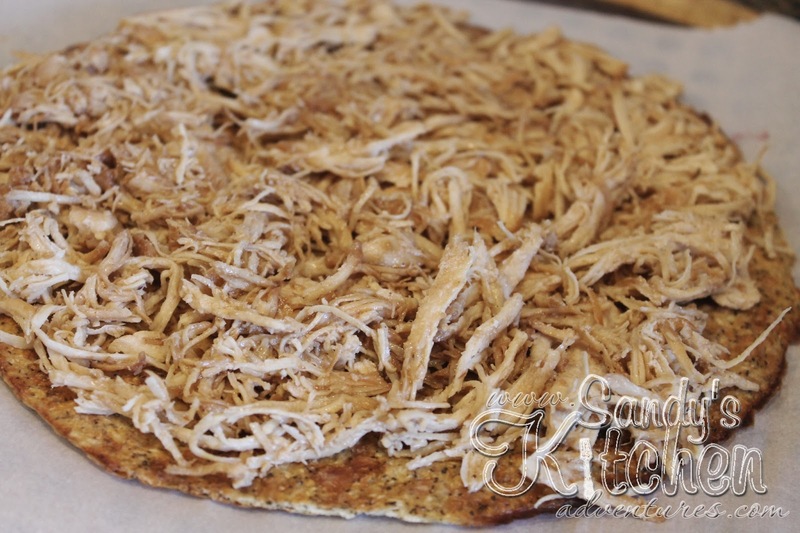 You still get to have delicious BBQ pulled chicken in a little over an hour, instead of the usual 6 to 8 hours! Sounds pretty good to me! I added just the chicken breasts and root beer to the instant pot and the chicken turned out extremely moist and sooo yummy! You can also add any extra seasonings if you like, but I didn't add anything else. The root beer helps tenderize the meat as well as give it a slightly sweetened flavor. If you don't have root beer, coca cola works too! 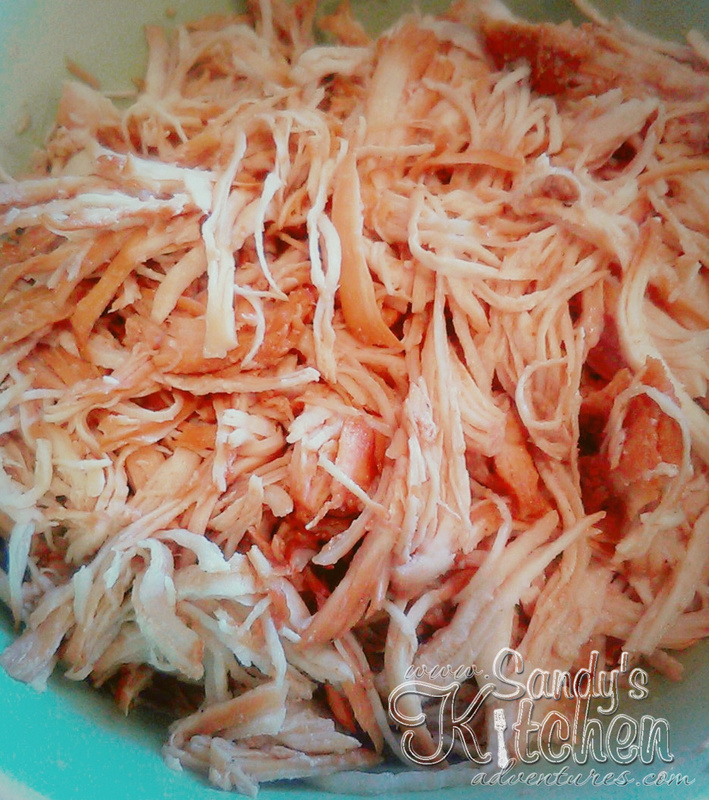 This is the shredded chicken before adding the BBQ sauce. After your chicken is cooked, drain the meat. Add the chicken to a bowl so you can add your BBQ sauce. I get asked often about which BBQ sauce I like to use. There are mainly two brands that I enjoy. The one above, G Hughes Smokehouse Sugar Free Hickory BBQ sauce, is the one I used for this recipe. 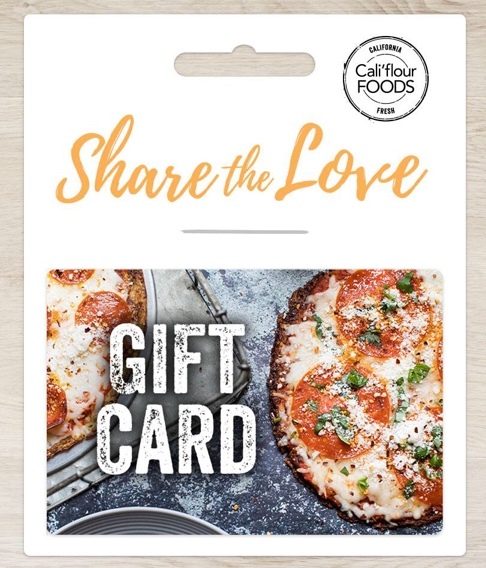 It is easy to find at your local grocery stores so you don't have to order it online. I found this one at Wally World by all the other BBQ sauces. I can't say that I like all their flavors though. I couldn't stand the Maple Brown flavor so I had to toss it, but Hickory is quite good. 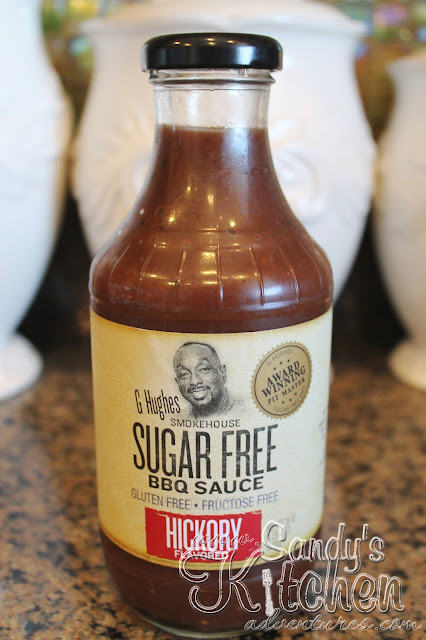 The other sugar free BBQ sauce I like is Guy's Award Winning BBQ Sauce. I have only found this sauce online which comes in 5 flavors: Hot, Original, Smokey Bacon, Smokey Garlic and Spicy. My favorite? Smokey Garlic! I have tried all of them and they were all yummy! You can find them HERE. 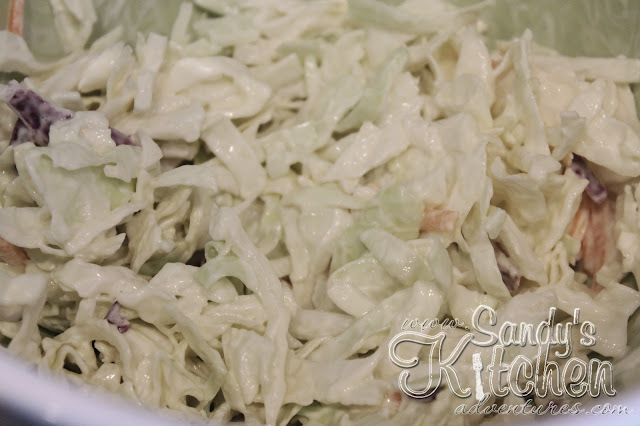 Once you have your BBQ pulled chicken set aside, make the cole slaw using already packaged cole slaw mix or shredded cabbage. I left the carrots in the mix because the slaw is only 5 grams of carbs for the entire 1 1/2 cups. A Green on the Medifast plan must be below 5 grams of carbs per 1/2 cup. Besides... the little orange pieces add color! 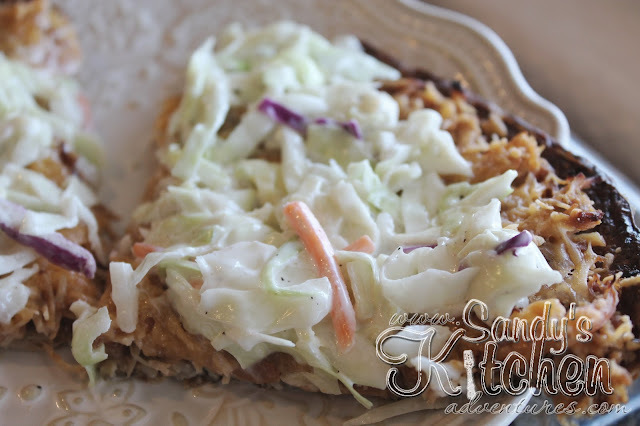 I added 2 tbsp of reduced fat mayo, 1/2 tsp apple cider vinegar, and about 1/2 a packet of Stevia to the cole slaw mix. I like to use Splenda Naturals Stevia packets or Nu Naturals Stevia packets. 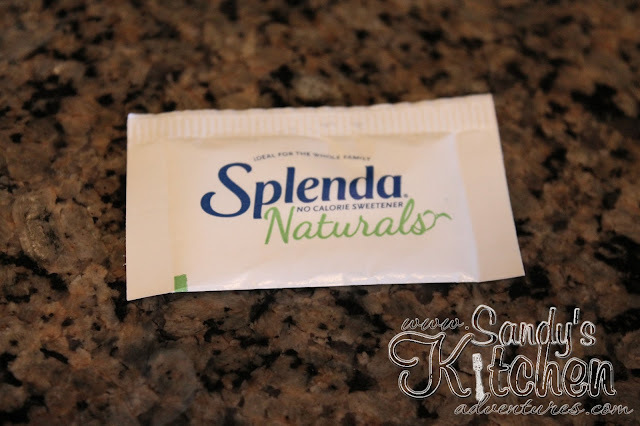 Both sweeteners work well for cooking. 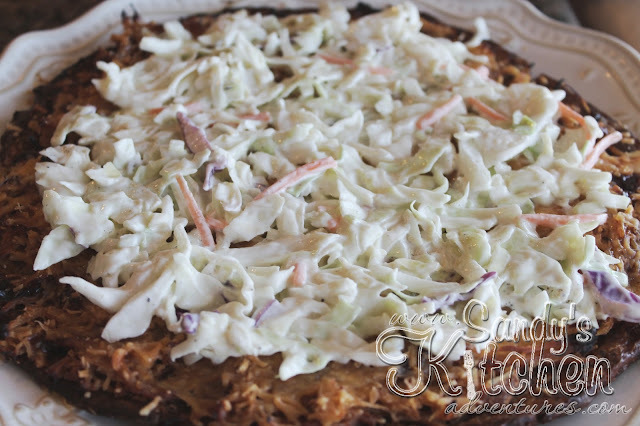 Set aside the cole slaw until the pizza is hot out of the oven! Place your cauliflower pizza crust on parchment paper (not waxed) and bake for about 5 minutes in a pre-heated oven. Doesn't that crust look delicious? 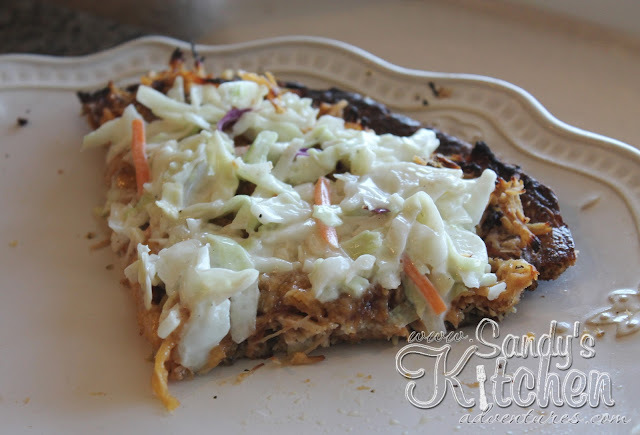 Add 6 ounces of pulled BBQ chicken on top of the crust. Drizzle more BBQ sauce on top if desired! I desire! 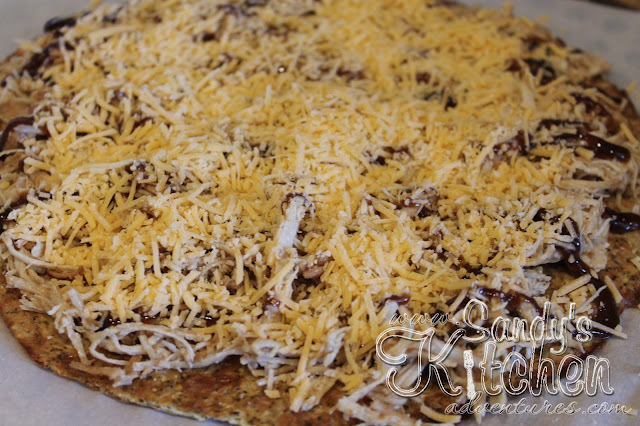 Sprinkle shredded sharp cheddar cheese over the chicken and bake for about 10 to 12 minutes or until cheese is melted. Once the pizza is out of the oven, then add the prepared cole slaw. ... but you can have two of those yummy slices! Crunchy creamy cole slaw over sweet BBQ chicken! Yes please! 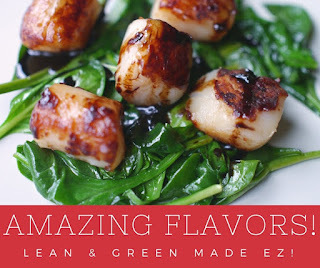 Enjoy this yummy recipe! Place chicken and root beer in the Instant Pot. please do so at this time. I added the root beer only. Put the lid on the Instant Pot and turn the float valve to sealing. Press the poultry setting button and adjust the cooking time to 25 minutes. When done cooking, do a 10 to 15 minute natural pressure release. After 10 to 15 minutes, there may still be some pressure left in the pot. That is okay. Just turn the float valve to venting to release the rest of the pressure. Wear an oven mitt and be careful of the steam! Drain the chicken and shred with a fork. Add BBQ sauce and set aside. Low for 6 to 8 hours or High for 3 to 4 hours. 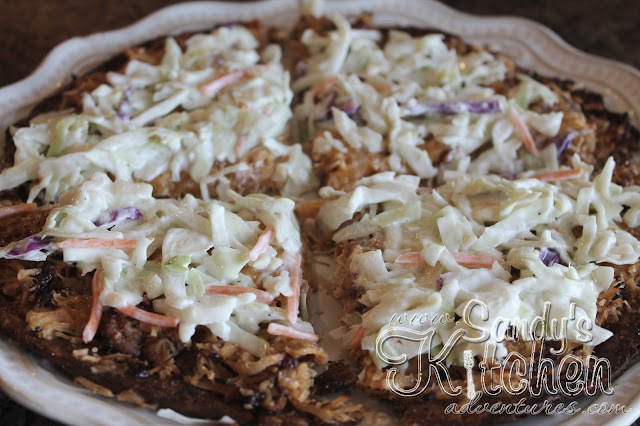 Reserve 6 ounces of pulled BBQ chicken for the recipe and store the rest as left overs. Place cole slaw mix or shredded cabbage in a small bowl. Add mayo, apple cider vinegar, and stevia to taste. 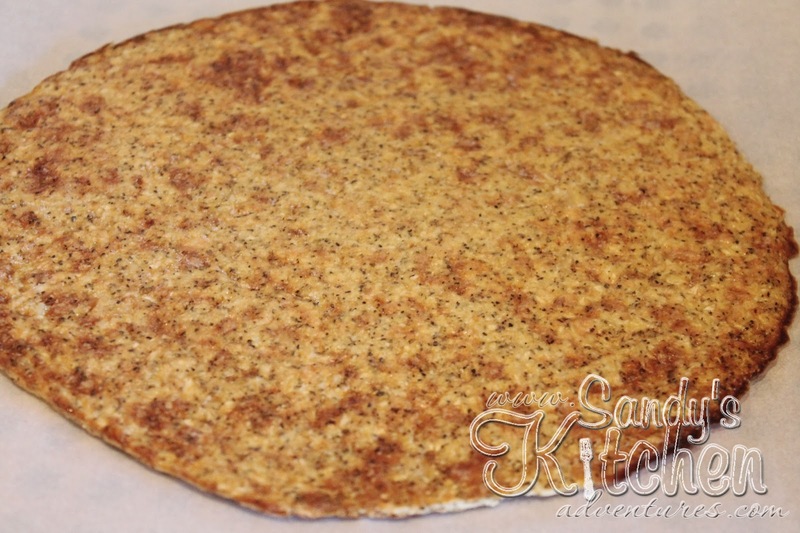 Add parchment paper on top of a pizza pan. 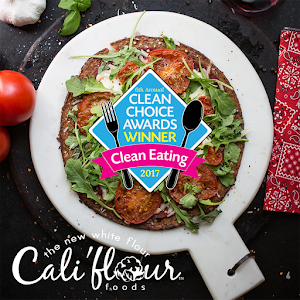 Place cauliflower pizza crust on parchment paper. 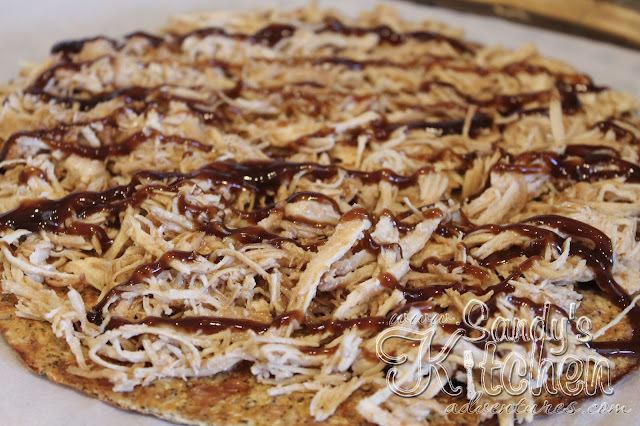 Top pizza crust with 6 ounces of pulled BBQ chicken. Drizzle any extra BBQ sauce on top if desired. Sprinkle shredded cheddar cheese on top. Bake for 10 to 12 minutes or until cheese is melted.